This official city map captures one of the most colorful and controversial pieces of land in Los Angeles history. 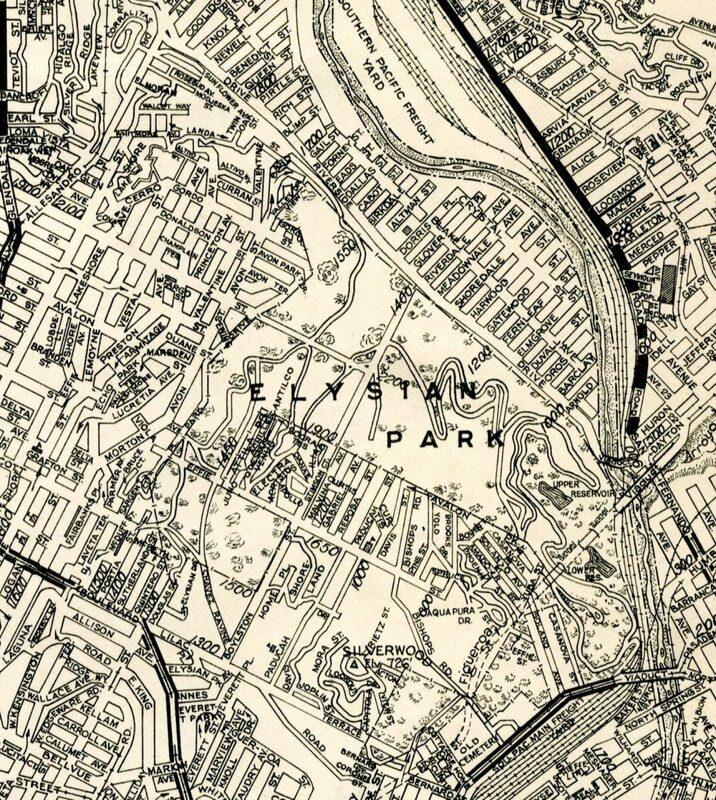 While the cartography identifies the larger area as Elysian Park, the focus here is on a place known best as Chavez Ravine. Once called Stone Quarry Hills, it was remarkably bucolic and timeless despite its proximity to the plaza and downtown Los Angeles. The ravine gets its name from Julian Chavez, who purchased the land in 1844 and then watched it grow to some 315 acres of rugged hillsides where livestock roamed. This map represents the area in 1930, before it grew rapidly after World War II and the land was divided into three idyllic communities: Bishop, Palo Verde and La Loma. Mexican-Americans, Filipinos, African-Americans, and Chinese co-existed peacefully in the ravine and managed to establish schools, help in the war effort, and win some community battles, including the banning of explosions conducted by local brickyards in Elysian Park. Famous photographs by Don Normark reveal a sweet little enclave that had plenty of character without an ounce of pretension. Later, the housing booms of post-war Los Angeles caused the city to covet the land and insist it be used for public housing. While the residents protested mightily, the city used eminent domain to clear the hillsides and the neighborhoods seen here on Reposa, Malvina, Brooks, Paducah, Bishop’s Road, Lookout Drive and Mora Street all vanished. Although the bulldozers were supposed to make a place for the dispossessed, the Communist paranoia of post-war American kept public housing plans from being realized and in time the land was traded to owner Walter O’Malley of the Los Angeles Dodgers. Dodger Stadium was built on the ground that was once called Lookout Mountain (here called Silverwood). What was once La Loma, Palo Verde, and Bishop was paved over and made into a parking lot. Yep, they paved paradise and put in a parking lot.